ေရထပ္ၾကီးမွာ စိုးရိမ္လို ့ေစာင့္ၾကည္ေနသူမ်ား ႏွင့္ ဘာကိုေစာင့္ေမွ်ာ္ေနၾကသလဲ?? On 2 November 2011, members of the Labour Rights Promoters and Defernders (LRPD) were informed by Burmese migrant workers at the ESB food factory in Nakon Pathom that they were stranded because of the floods and only had enough food for two or three days. Electricity had been cut by the apartment owner and that they had to request the landlord to provide cooking gas. LRPD members alerted about their plight to friends, sympathizers and other migrant workers and urgently organized a relief trip to Kha Thonmai Soi (9), Phutttha Monton, Sai 4, Sam Phrum District, Nakhon Pathom Province, Thailand. The workers there were provided with emergency supplies. About 200 Burmese migrant workers had been working at that factory and most of them have now gone back or are making preparations to go back to Burma. 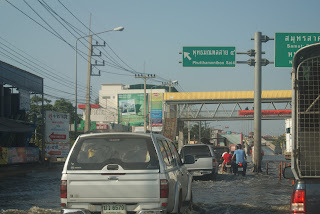 On 3 November 2011, flood waters entered Phuttha Monton area affecting many factories where Burmese migrant workers were working. The LRPD organized a relief trip to the region by alerting Burmese migrant workers from areas unaffected by floods to join the relief efforts. On 10 November 2011, a joint relief team of LRPD members and Burmese migrant workers from Vita Food factory went to Phutta Monton area to help the flood victims. There was difficulty in renting boats to carry supplies to the flooded area. It took three hours before a boat became available to transport relief supplies to Puttha Monton Sai 5, Sam Phrum District, Nakhon Pathom Province. About 2,500 Burmese migrant workers were staying at the apartments in that flooded area. They were either waiting for their unpaid wages or for the factories to reopen. Some workers returned to Burma after they received their wages but some undocumented workers could not, even if they wanted to, because they did not have work permits or passports. When we arrived at the apartment where about 900 workers were staying, they explained that the landlord had cut off the electricity and water supply and was selling candles and water at steeper prices. Those living in that apartment claimed that they already paid their rents and also the fees to use electricity and water. When they asked the landlord for water and electricity, the owner showed them his handgun and threatened to hurt anybody who demanded water and power. The workers were told to move out if they were not happy with the situation. When the LRPD team visited the apartment, the living conditions were horrible. The area was reeking with bad smells and flood waters around the area were dirty. Potable water was not available as there is no running water. Plastic gabs used human wastes and dumped into the water. Some workers, who were fortunate, did their cooking at a nearby apartment where electricity was provided and where their friends were living. Elsewhere, no electricity or fresh water is available and workers living in unsanitary conditions face serious health risks. The Burmese migrant workers who are flood victims need first aid kits, medicines, and precautionary health protection measures, in addition to food and water. Presently, although Thai relief teams and NGOs are distributing relief goods, their arrival is uncertain and irregular. The Burmese workers said they received some supplies from Thai soldiers and police. LRPD appreciates and is very encouraged by the goodwill of the workers of Vita Food Factory, who not only contributed but also helped collect relief items from other Burmese migrant workers so that the LRPD deliver them to the Burmese flood victims.